Comfort, O comfort my people, says your God. Speak tenderly to Jerusalem, and cry to her that she has served her term, that her penalty is paid, that she has received from the LORD's hand double for all her sins. A voice cries out: "In the wilderness prepare the way of the LORD, make straight in the desert a highway for our God. 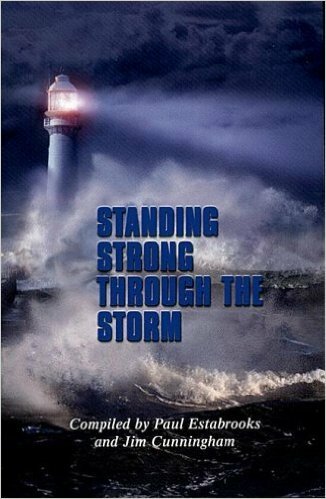 Every valley shall be lifted up, and every mountain and hill be made low; the uneven ground shall become level, and the rough places a plain. Then the glory of the LORD shall be revealed, and all people shall see it together, for the mouth of the LORD has spoken." A voice says, "Cry out!" And I said, "What shall I cry?" All people are grass, their constancy is like the flower of the field. The grass withers, the flower fades, when the breath of the LORD blows upon it; surely the people are grass. The grass withers, the flower fades; but the word of our God will stand forever. Get you up to a high mountain, O Zion, herald of good tidings; lift up your voice with strength, O Jerusalem, herald of good tidings, lift it up, do not fear; say to the cities of Judah, "Here is your God!" See, the Lord GOD comes with might, and his arm rules for him; his reward is with him, and his recompense before him. He will feed his flock like a shepherd; he will gather the lambs in his arms, and carry them in his bosom, and gently lead the mother sheep. 1 You have been gracious to your land, O LORD, you have restored the good fortune of Jacob. 2 You have forgiven the iniquity of your people and blotted out all their sins. 3 You have withdrawn all your fury and turned yourself from your wrathful indignation. 4 Restore us then, O God our Savior; let your anger depart from us. 5 Will you be displeased with us for ever? will you prolong your anger from age to age? 6 Will you not give us life again, that your people may rejoice in you? 7 Show us your mercy, O LORD, and grant us your salvation. 8 I will listen to what the LORD God is saying, for he is speaking peace to his faithful people and to those who turn their hearts to him. 9 Truly, his salvation is very near to those who fear him, that his glory may dwell in our land. 10 Mercy and truth have met together; righteousness and peace have kissed each other. 11 Truth shall spring up from the earth, and righteousness shall look down from heaven. 12 The LORD will indeed grant prosperity, and our land will yield its increase. 13 Righteousness shall go before him, and peace shall be a pathway for his feet. but they went on from Perga and came to Antioch in Pisidia. And on the sabbath day they went into the synagogue and sat down. After the reading of the law and the prophets, the officials of the synagogue sent them a message, saying, "Brothers, if you have any word of exhortation for the people, give it." So Paul stood up and with a gesture began to speak: "You Israelites, and others who fear God, listen. The God of this people Israel chose our ancestors and made the people great during their stay in the land of Egypt, and with uplifted arm he led them out of it. For about forty years he put up with them in the wilderness. After he had destroyed seven nations in the land of Canaan, he gave them their land as an inheritance for about four hundred fifty years. After that he gave them judges until the time of the prophet Samuel. Then they asked for a king; and God gave them Saul son of Kish, a man of the tribe of Benjamin, who reigned for forty years. When he had removed him, he made David their king. In his testimony about him he said, 'I have found David, son of Jesse, to be a man after my heart, who will carry out all my wishes.' Of this man's posterity God has brought to Israel a Savior, Jesus, as he promised; before his coming John had already proclaimed a baptism of repentance to all the people of Israel. And as John was finishing his work, he said, 'What do you suppose that I am? I am not he. No, but one is coming after me; I am not worthy to untie the thong of the sandals on his feet.' "My brothers, you descendants of Abraham's family, and others who fear God, to us the message of this salvation has been sent. Now the time came for Elizabeth to give birth, and she bore a son. 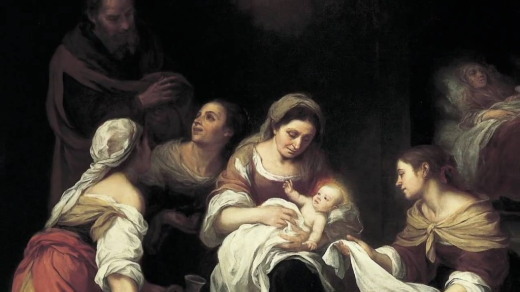 Her neighbors and relatives heard that the Lord had shown his great mercy to her, and they rejoiced with her. On the eighth day they came to circumcise the child, and they were going to name him Zechariah after his father. But his mother said, "No; he is to be called John." They said to her, "None of your relatives has this name." Then they began motioning to his father to find out what name he wanted to give him. He asked for a writing tablet and wrote, "His name is John." And all of them were amazed. Immediately his mouth was opened and his tongue freed, and he began to speak, praising God. Fear came over all their neighbors, and all these things were talked about throughout the entire hill country of Judea. All who heard them pondered them and said, "What then will this child become?" For, indeed, the hand of the Lord was with him. Then his father Zechariah was filled with the Holy Spirit and spoke this prophecy: "Blessed be the Lord God of Israel, for he has looked favorably on his people and redeemed them. He has raised up a mighty savior for us in the house of his servant David, as he spoke through the mouth of his holy prophets from of old, that we would be saved from our enemies and from the hand of all who hate us. Thus he has shown the mercy promised to our ancestors, and has remembered his holy covenant, the oath that he swore to our ancestor Abraham, to grant us that we, being rescued from the hands of our enemies, might serve him without fear, in holiness and righteousness before him all our days. And you, child, will be called the prophet of the Most High; for you will go before the Lord to prepare his ways, to give knowledge of salvation to his people by the forgiveness of their sins. By the tender mercy of our God, the dawn from on high will break upon us, to give light to those who sit in darkness and in the shadow of death, to guide our feet into the way of peace." The child grew and became strong in spirit, and he was in the wilderness until the day he appeared publicly to Israel. Holy Christ, who has taught us to forgive our enemies, and promised that as we forgive others, so shall our Father forgive us: I pray for all who have died at the hand of others: Victims of common murder, casualties of war, people chopped down by machete in Rwanda, Muslims stripped and slaughtered by Christian Serbs, people beheaded by Isis, Christians hung on crosses in France. The list of Satan's work is endless and timeless. Let us bless the Lord. Alleluia! Thanks be to God! Alleluia! 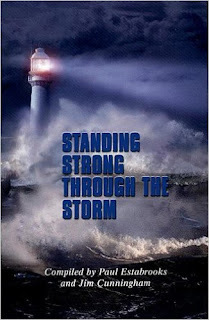 2 Thessalonians 3:3 (NIV) But the Lord is faithful, and he will strengthen you and protect you from the evil one. In the beginning was the Word, and the Word was with God, and the Word was God. . . . In him was life; and the life was the light of men. Have you ever sat back and thought about how Christianity is different from other religions? There are obvious dozens of specific differences — we worship Jesus Christ, we go to churches and worship (generally) on Sunday, we believe in life after death, and so on. But at a more categorical level, there are several things that make Christianity different from any other religion, and the biggest one is found in John 1:1. We do not worship a philosophy or an idea; Jesus' primary meaning was not his role as a revered teacher, like Buddha or Confucius, or even as a prophet like Mohammad or Moses. We worship a person who was God; no other religious figure (among major religions) even makes this claim, much less a credible claim believed by millions and billions of people. The extraordinary thing about it is that we are able, through the grace of God in making Christ incarnate, to actually know God as a person. That is, a human being. He was a flesh-and-blood friend to the disciples. He ate meals with them; he took trips with them; he talked with them. He was like them: he got hungry, he got tired, he bled, and he died. 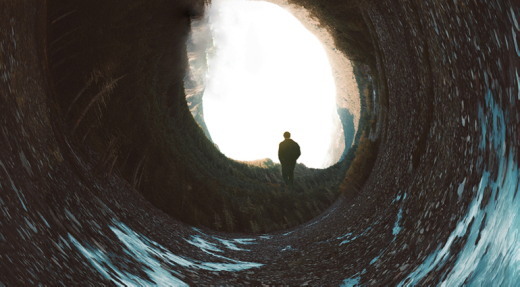 Setting aside the critical theological implications of salvation by belief in Christ, if you follow Judaism or Islam or any other religion, you lose something else as well: God is not your friend. One reason He came down to dwell among us was just so that we could love him, not in an abstract way, but just as we love our favorite person. He has left us for a while, but we still know him as an intimate and loving friend; partly through proxy, of course, reading about his friendship with others who are long gone, but also through the Spirit God sent to keep us company while Christ was away from the earth. Yo soy el que por amor a mí mismo borra tus transgresiones y no se acuerda más de tus pecados. Dios me ha inquietado de una manera muy especial a tener un acercamiento con nuestros amigos que se encuentran en diferentes centros de corrección. Con sus cartas, me dicen que se sienten muy agradecidos cuando nos acordamos de ellos, elevamos una oración a su favor o cuando dejamos cualquier cosa que sea importante y vamos a conocerles. Quiero hacer un reconocimiento a mis nuevos amigos y sé que Dios nos hablará cuando les exprese las cosas que me han conmovido y me han enseñado a sentir misericordia, ternura y cariño por cada uno de ellos. Víctor ha sido un regalo conocerlo después que me escribiera para informarme que fue cabecilla de las Maras Salvatruchas. En su carta de corazón abierto, me cuenta de todos los pactos que hizo con el enemigo y de qué manera engañan a los jóvenes para que caigan en el mundo cruel de las pandillas. También me explica lo que le llevó a estar en peligro de muerte hasta que cayó preso. Hoy en día, con solo veintiún años de edad y en prisión, se ha reconciliado con Dios y ha comenzado el cambio en su vida. He tenido el privilegio de conocer a Víctor, de conversar con él, de orar juntos y poder escuchar cómo a gritos quisiera que todos los jóvenes que andan en malos pasos se alejen y no terminen en la cárcel como él. In Eritrea, the government restricts the freedom of religion of faith groups. The only groupings permitted are the Eritrean Orthodox Church, Roman Catholic Church, Evangelical Lutheran Church and Islam. Everyone who is caught at a meeting of believers outside these four official religious groups, even in a private house, can be arrested, tortured and put under pressure to renounce his faith. Thousands of Christians are being held at police stations, in containers, at military bases and in prisons. Even though many of them have been held for years, none of them has had a trial. In many cases, Christians are also beaten or abused in some other way. Isaac is one of these prisoners. He heard about God’s love from soldiers in the military unit in which he was fighting during the war with Ethiopia. On the basis of their testimony, he decided to become a Christian and was secretly slipped a Bible. He buried it in the sand and when he had the opportunity, he read the Word of God somewhere outside the army camp. He tried to do so as inconspicuously as possible, but one day he was discovered. Almost from his first day as a Christian, he was persecuted. He was tortured and even left out in the burning sun, but he refused to renounce his faith. God’s love and God’s Word had become too important for him. In the end, he was locked up, just like other Christian prisoners in Eritrea. He has become a living legend, because he has held on to his faith. A number of Christian prisoners, who are being held in containers, have been given Bibles in secret. They have divided them into portions, and in this way, each believer has a small part of the Bible. When the container is closed, it is too dark to read. But as soon as the doors are opened to let in some air or to hand out food, something amazing happens. The prisoners do not immediately run outside for fresh air or to eat. First they inconspicuously hold their portions of the Bible to the light in order quickly to be able to read a few verses and to be strengthened by God’s Word. 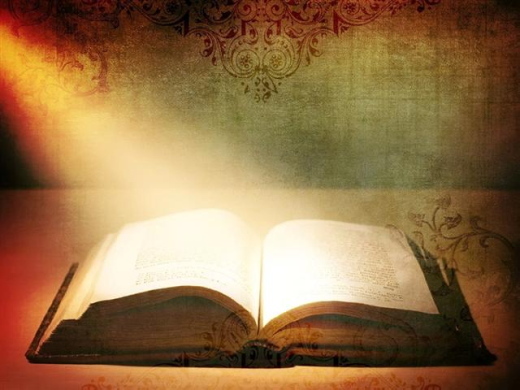 RESPONSE: Today I will treasure my freedom to read and meditate on God’s Word. PRAYER: Lord, I pray Your Spirit of Peace upon my brothers and sisters in prison today in Eritrea. May they be encouraged by Your Word! When Priscilla and Aquila heard [Apollos], they invited him to their home and explained to him the way of God more adequately. A couple in our church provides invaluable training for people who are planning to go into the ministry. Marshall and Chris show young couples how to love one another and how to raise their children wisely and well. They host a small group in their home in which they study and apply Scripture together. They talk through what it means to shape their homes around Christ, and how to do so while working in the church. Marshall and Chris share special meals with these couples and fuss over the kids. Sounds great, doesn’t it? But the work is draining. There are times when this mature couple would like a break from the emotional demands of such mentoring—even just a quiet night at home. Plus, it’s hard to constantly be saying goodbye to families they’ve grown to love who are moving on in ministry. But Marshall and Chris mentor others because they believe in building the church. The apostle Paul knew a couple like that, a couple who always worked together as a team. Their names were Aquila and Priscilla. And they understood the price of following Christ. Paul wrote about them in Romans 16:3, saying, “They risked their lives for me.” Their initiative to live for others came from praying together and talking over ministry opportunities; it also came from a selfless love of other believers and, of course, their devotion to Jesus. In more than 30 years of marriage, my wife and I have frequently invited people to stay in our home. Sometimes we offer a place to a student who is taking a two- or three-week class at Trinity Evangelical Seminary, which is near our home. Other times, we provide a place for someone who has nowhere else to go. Once we opened our home for 15 months to a young woman and her preschooler. Sometimes such commitments proved to be far more complicated than we had imagined; yet the rewards often exceeded our expectations. Every ministry has its price and its privileges, and every ministry undertaken by a couple can be a challenge to their marriage. Learning to share the work, to complement one another’s gifts, and to pray together through difficulties are not always easy. Think about some of the issues Aquila and Priscilla must have talked about and prayed through together. They must have recognized and valued one another’s natural and spiritual gifts and determined to work as a team. They were so good at working together that Scripture always mentions them as a team. They were such students of Scripture that they were able to make a significant contribution to the training of one of the church’s most promising leaders: Apollos. And they had the gift of hospitality, for a church met regularly in their home (see 1 Corinthians 16:19). What a model for marriage! What about Priscilla and Aquila’s relationship appeals most to us? What couples do we know who have effective ministries together (whether in their home or beyond it)? What are some ministries that most appeal to us as a couple? Why? 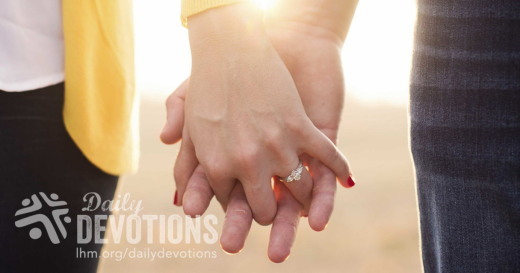 What steps might we take to expand or deepen our household ministry as a couple? Are we sensing that God wants us to open our home to others to perhaps lead a youth group, parent foster children, mentor engaged couples or host a neighborhood Bible study? LHM Daily Devotion - June 24, 2017 "Reason to Rejoice"
I was recently talking to a lady about things for which I am most grateful. This past week I was talking to a lady about the list of things for which I am most grateful. Even as I was speaking, I could see her sit up a little straighter, and set her jaw a little firmer. When I finished, with a tough tone in her voice and a steely look in her eye, she said, "I have absolutely nothing for which to be thankful." This was amazing since this 81-year-old lady was very well off; she still lived on her own; she only went to the hospital when she was calling on her younger friends; and when she did visit them, she drove a very expensive, late-model luxury car. Now I know some of you may find yourself in agreement with that lady. If that's the case, I've got something in my hand that will change your mind and put things into perspective. And what can perform such a miracle? Nothing less than a copy of the health history form I got from my doctor. You know, the papers you have to fill out before you see a physician for the first time. Well, that's the form he gave me for this devotion. Now you may be having a bad year, but let me ask you what the doctor asked me. "Do you have blood pressure or related problems, liver problems, gallbladder problems, yellow jaundice, hepatitis, heart trouble, kidney disease, stomach problems, indigestion, ulcers, bleeding tendency, excessive bruising, any part of your body paralyzed or numb, broken bones in the face, neck, jaw or back, back problems, excessive scarring?" Folks, that's just part of column one in a document that runs four pages and is twelve columns wide. You may have some of those things I just listed, but you don't have all of them. This means if you can't give thanks for what you've got, you can give thanks for the things you don't have. Unfortunately, giving thanks just doesn't come easy to many of us. Look at the story of the children of Israel. Through some mighty miracles, God had freed them from slavery and then He had destroyed Pharaoh's chariots. This should have made God's people thankful. It should have, but the 15th chapter of Exodus says, "And the people murmured against Moses, saying, 'What shall we drink?'" (Exodus 15:24). God took care of that problem, and the people left God alone until the very next chapter. Chapter 16 says the children of Israel murmured against Moses (saying), "For You have brought us forth into this wilderness, to kill this whole assembly with hunger" (see Exodus 16:1-3). God took care of that, and the people were pleased until chapter 17 where it says that the people murmured against Moses, and said, "Wherefore is this that You have brought us up out of Egypt, to kill us and our children and our cattle with thirst" (see Exodus 17:1-3). You get the idea. They came to God when they wanted something; they complained when He didn't give them what they wanted; and then they ignored Him until they wanted something else. We who no longer have our sins counted to us because of the Savior's intercession ought to learn from their mistakes. Because of the Christ, we have been forgiven; we have been freed from the terrors of hell; and we have the promise of eternal life in the mansions our Savior will bestow. And that, my friends, is plenty cause for which to give thanks. It was time for our church to commission a new group of leaders. To symbolize their roles as servant-leaders, the church elders participated in a memorable foot-washing ceremony. Each of the leaders—including the pastor—washed each other’s feet as the congregation observed them. What they did that day was modeled for us by Jesus Christ, as recorded in John 13. In that incident, which happened at what is called the Last Supper, Jesus “got up from the meal, . 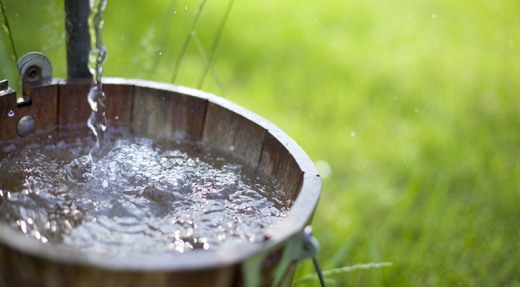 . . poured water into a basin and began to wash his disciples’ feet” (John 13:4–5). Later, as Jesus was explaining to His disciples why He had done this, He said, “No servant is greater than his master, nor is a messenger greater than the one who sent him” (v. 16). He also said, “I am among you as one who serves” (Luke 22:27). If it is not below Jesus’s dignity to do such a lowly task, it is not below any of us to serve others. What an amazing example He set for all of us. Indeed, He “did not come to be served, but to serve” (Mark 10:45). He showed us what it means to be a leader and a servant. That’s Jesus, the One who serves. Dear Lord, help me serve others. Guide me to set aside my personal interests and desires to provide help to those who need it. No deed is small when done for Christ. Anos atrás, alguns membros da minha família se reuniram num restaurante para celebrar o 100.º aniversário de minha avó. Mas ela não estava lá. Está no céu há 16 anos. Mas nós estávamos tão gratos pela sua influência sobre nós que queríamos festejar sua vida. Usamos suas xícaras e pires cor-de-rosa e tomamos chá juntos e relembramos a sua doçura, sabedoria e senso de humor típico. Nós nos recordamos dela. Quando mais de um dos nossos cinco sentidos está envolvido numa experiência, algo “toca” em nossa memória. Quem sabe se por saber que temos a forte tendência de esquecer coisas, Jesus escolheu um método que envolveria alguns de nossos sentidos para nos ajudar a relembrar o Seu sacrifício. Foi numa refeição — momento de comer e beber — quando disse aos Seus seguidores: “…fazei isto em memória de mim” (1 Coríntios 11:24). Quando participamos da Ceia do Senhor, lembramos do amor e sacrifício de Jesus, de forma tangível. A comunhão é mais do que um ritual. Cada momento deveria ser experimentado como se você estivesse sentado ao redor da mesa com os discípulos, quando Jesus falou isso. Com corações transbordantes de gratidão, celebramos a Ceia do Senhor como um momento de lembrança do Seu sacrifício por nossos pecados. Lembrar-se da morte de Cristo traz coragem para hoje e esperança para o amanhã. Khi hội thánh chúng tôi bổ nhiệm một nhóm lãnh đạo mới, để nói lên tinh thần lãnh đạo đầy tớ, các trưởng lão hội thánh đã tham dự một buổi lễ rửa chân đáng nhớ. Từng người lãnh đạo—kể cả mục sư—đã rửa chân cho nhau trong lúc hội chúng quan sát họ. Điều họ làm hôm đó là điều Chúa Jêsus Christ đã nêu gương cho chúng ta, như được chép trong Giăng 13. Trong sự kiện xảy ra vào Bữa Tối Cuối Cùng, Chúa Jêsus “đứng dậy khỏi bàn ăn,… đổ nước vào chậu, và bắt đầu rửa chân cho các môn đồ” (Giăng 13:4-5). Sau đó, khi Chúa Jêsus giải thích cho các môn đồ lý do Ngài làm điều này, Ngài phán: “Đầy tớ không lớn hơn chủ, sứ giả không lớn hơn người sai phái mình” (c. 16). Ngài cũng phán: “Ta ở giữa các con như người phục vụ vậy” (Lu. 22:27). Nếu Chúa Jêsus đã hạ mình làm một công việc hèn mọn như vậy thì không có lý do gì để chúng ta không chịu hạ mình phục vụ người khác. Ngài đã nêu một gương mẫu tuyệt vời cho tất cả chúng ta. Thật vậy, Ngài “đã đến không phải để được phục vụ nhưng để phục vụ” (Mác 10:45). Ngài đã cho chúng ta thấy ý nghĩa của việc lãnh đạo trong tinh thần đầy tớ. Chúa Jêsus là Đấng phục vụ. Lạy Chúa, xin giúp con phục vụ người khác. Xin dạy con biết từ bỏ những lợi ích và ao ước của mình để giúp những người đang cần. Không việc gì là hèn mọn khi được làm cho Đấng Christ. [Jesús] puso agua en un lebrillo, y comenzó a lavar los pies de los discípulos… (v. 5). Era hora de que nuestra iglesia designara a un nuevo grupo de líderes. Para representar su función como líderes siervos, los ancianos de la iglesia participaron en una memorable ceremonia de lavado de los pies. Cada uno de los líderes, incluido el pastor, le lavó los pies a otro mientras la congregación observaba. Jesucristo fue el primero en darnos el ejemplo de esto, como vemos en Juan 13. En esa ocasión, durante lo que llamamos la última cena, Jesús «se levantó de la cena […], puso agua en un lebrillo, y comenzó a lavar los pies de los discípulos» (Juan 13:4-5). Más tarde, Jesús les explicó a los discípulos por qué lo había hecho y les dijo: «El siervo no es mayor que su señor, ni el enviado es mayor que el que le envió» (v. 16). Además, les dijo: «Yo estoy entre vosotros como el que sirve» (Lucas 22:27). Si Jesús no consideró humillante realizar una tarea tan despreciable, nosotros también debemos servir a los demás. ¡Qué ejemplo maravilloso que nos dejó el Señor! Sin duda, Él «no vino para ser servido, sino para servir» (Marcos 10:45), y nos mostró lo que significa ser líder y siervo. Ese es Jesús, el que sirve. Querido Señor, ayúdame a servir a otros. Guíame a dejar de lado mis intereses y deseos para ayudar a los necesitados. Nada de lo que hagamos es insignificante si es para Cristo. In unserer Gemeinde sollte eine Gruppe neuer Leiter eingesetzt werden. Um ihre Rolle als dienende Leiter zu veranschaulichen, nahmen die Gemeindeältesten an einer Fußwaschung teil. Jeder der Leiter—der Pfarrer eingeschlossen—wusch einem anderen die Füße. Die Gemeinde sah ihnen zu. Das Beispiel für das, was sie taten, hat uns Jesus selbst gegeben, wie uns in Johannes 13 berichtet wird. Bei dem, was wir „das letzte Abendmahl“ nennen, stand Jesus „vom Mahl auf . . . goss Wasser in ein Becken [und] fing an, den Jüngern die Füße zu waschen“ (Joh. 13,4-5). Später erklärte er ihnen, warum er das getan hatte. „Der Knecht ist nicht größer als sein Herr und der Apostel nicht größer als der, der ihn gesandt hat“ (V.16). Und auch: „Ich bin unter euch wie ein Diener“ (Luk. 22,27). Wenn es für Jesus nicht unter seiner Würde war, solch einen niederen Dienst zu tun, dann ist es auch nicht unter unserer Würde, anderen zu dienen. Was für ein beeindruckendes Beispiel hat er uns gegeben. Ja, er „ist nicht gekommen, dass er sich dienen lasse, sondern dass er diene“ (Mark. 10,45). Er hat uns gezeigt, was es heißt, ein Leiter und gleichzeitig ein Diener zu sein. Das ist Jesus: Einer, der dient! Lieber Herr, hilf mir, anderen zu dienen. Mach mich bereit, meine eigenen Interessen und Wünsche beiseite zu schieben und denen zu helfen, die Hilfe nötig haben. Nichts ist zu gering, wenn es für Jesus getan wird. L’heure était venue pour notre Église d’envoyer un nouveau groupe de leaders. En guise de symboles de leurs rôles de serviteurs‑leaders, les autorités de l’Église ont participé à une cérémonie mémorable de lavage de pieds. Tous les leaders – y compris le pasteur – se sont lavé les pieds les uns aux autres sous le regard des membres de l’assemblée. Ce qu’ils ont fait ce jour‑là, c’est Jésus‑Christ qui nous en a donné l’exemple, tel que relaté dans Jean 13. En effet, lors de cet incident survenu durant ce que l’on appelle la sainte Cène, Jésus « se leva de table […] versa de l’eau dans un bassin, et il se mit à laver les pieds des disciples » (JN 13.4,5). Ensuite, pour expliquer son geste à ses disciples, il leur a dit que « le serviteur n’est pas plus grand que son seigneur, ni l’apôtre plus grand que celui qui l’a envoyé » (V. 16). Il a également déclaré : « [Je] suis au milieu de vous comme celui qui sert » (LU 22.27). S’il n’est pas indigne de la part de Jésus de faire une tâche aussi humble, il ne l’est pas plus de la part de chacun de nous d’être au service d’autrui. Quel exemple remarquable Jésus nous a donné à tous ! Effectivement, il « est venu, non pour être servi, mais pour servir » (MC 10.45). Il nous a montré ce que c’est que d’être tout à la fois leader et serviteur. Voilà précisément ce qu’est Jésus, à savoir celui qui sert. Aucune oeuvre n’est petite si elle est faite pour Christ. І ось настав у нашій церкві час посвячення на служіння нових лідерів. Щоб показати їм символічний урок того, що вони мають служити іншим, служителі нашої общини провели церемонію омовіння ніг. Служителі похилого віку, включно з пастором, мили один одному ноги на очах усієї общини. Цим дійством вони повторили те, що зробив колись Сам Ісус, про що записано в тринадцятому розділі Євангелії від Івана. Під час тієї зустрічі з учнями, яку ми тепер називаємо Останньою Вечерею, наш Господь “налив води до вмивальниці, та й зачав обмивати ноги учням, і витирати рушником, що ним був підперезаний” (Ів. 13:5). Пізніше, пояснюючи учням, чому Він так вчинив, Ісус Христос сказав: “Раб не більший за пана свого, посланець же не більший від того, хто вислав його” (Ів. 13:16). А ще Він сказав: “Я серед вас, як службовець” (Лк. 22:27). Якщо для Ісуса не було приниженням зробити таку роботу – мити ноги учням, – то не повинно бути приниженням і для нас служити іншим. Який чудовий приклад показав Христос усім нам! Дійсно, “Син Людський прийшов не на те, щоб служили Йому, але щоб послужити” (Мр. 10:45). Він показав нам, що значить бути лідером-слугою. Саме таким був Ісус – Слугою для всіх! Дорогий Господи, допоможи мені служити іншим. Навчай мене, відклавши власні інтереси та бажання, пропонувати допомогу тим, хто її потребує. Будь-яка справа, зроблена для Христа, − не дрібниця. В нашей церкви пришло время посвящения новых служителей. Чтобы показать свою определенную Богом роль, старшие служители, в том числе пастор, в присутствии собрания совершили символическое омовение ног новоизбранным сотрудникам на Божьей ниве. То же самое сделал Иисус Христос для учеников на последней вечере, как об этом рассказывается в Евангелии от Иоанна. Господь «встал с вечери… влил воды в умывальницу и начал умывать ноги ученикам» (Ин. 13:4-5). Позже, объясняя апостолам Свои действия, Христос сказал: «Раб не больше господина своего, и посланник не больше пославшего его» (Ин. 13:16). И добавил: «А Я посреди вас – как служащий» (Лк. 22:27). Если для Спасителя такое неблагородное дело не было унизительным, то и нам не следует чуждаться кроткого и смиренного служения друг другу. Он оставил нам прекрасный пример. Воистину, «Сын Человеческий не для того пришел, чтобы Ему служили, но чтобы послужить» (Мк. 10:45). Он показал, что значит быть руководителем и слугой. Таков наш Господь. Тот, Кто послужил нам. Дорогой Господь, помоги мне служить людям. Дай решимости отложить свои личные интересы и желания ради помощи имеющим нужду. Любое дело важно, если сделано для Христа.